“Transforming Faith into Action” continues to be the main calling for faith-based organizations (FBOs) in the Philippines as efforts to realize peace and lasting development remain to be a major challenge in Marawi City. At least 51 representatives from 23 FBOs in the country gathered for a roundtable discussion in October 17, 2017 to strengthen coordination and response actions in the embattled city including the Catholic Church through NASSA/Caritas Philippines, the National Council of Churches in the Philippines (NCCP), and the Philippines Council of Evangelical Churches (PCEC) – Philippine Relief and Development Services (PHILRADS). “We are now considered to be the strongest alliance of FBOs in the country with over 30,000 local churches, national organizations and international affiliations, and it is imperative that we do our share to help our Maranao brothers and sisters” said Bishop Noel Pantoja, PCEC National Director during the event. As of this report, the group already has a combined PhP 28.5 million – worth of direct response helping more than 10,000 internally displaced families. In the last five months since May, 2017, the collective efforts were able to provide food packs, hygiene and shelter kits, essential non-food items, medical and psychosocial support and other capacity building activities for the IDPs and volunteers in Marawi City, Iligan City, Cagayan de Oro and other neighbouring provinces. With the continuing commitment of putting people at the center, a Marawi survivor was invited to testify about how they perceive Marawi’s rehabilitation based on their need. “Ang gusto po namin, maibalik ang Marawi as it was before. Nabuhay po kami ng simple sa community without any presence ng complex infrastructures katulad ng nakaplanong itayo sa aming lugar,” appealed Arwa Macasayan, 20 years old, of Tindeg Ranao. (What we want is for Marawi to return to normal. We lived a simple life in our community without any presence of complex infrastructures like what are being planned in our place.) She identified as priority needs the rebuilding of their houses, schools and mosques. 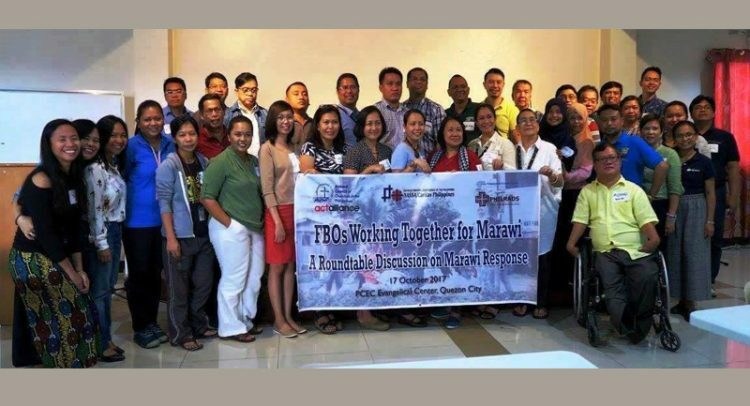 The participating FBOs sees the need to continue consulting and working with the affected communities in planning and implementing its rehabilitation plans for Marawi. “While we see these efforts as still needed on-ground, we are also intensifying our campaign to promote peace, solidarity and cooperation among Christians and Muslims. Efforts to start the process of healing are on-going and the FBOs’ initiatives to realize this goal is vital to continuous dialogue and reconciliation,” Fr. Edwin Gariguez, Executive Secretary of NASSA/Caritas Philippines added. “We are happy to see that an alliance between the 3 Christian councils in the Philippines and other FBOs have seen the necessity of working together so as to be relevant and responsive to the needs of our people – particularly those affected by the Marawi crisis. We affirm that collective action and the people’s participation in any action – has significant impact on the life of the people who have been in waiting for a long time.” Ms. Darlene Marquez-Caramanzana, Executive Assistant of NCCP stated. “Part of the action plans now is to come up with a Philippine FBO Forum (PFF) that would be the central platform of the FBOs in responding to humanitarian and development needs of the poorest and the most vulnerable, and the displaced and the marginalized,” Fr. Gariguez concluded. Other Christian and evangelical groups will be invited to strengthen the organization, and to ensure greater coordination and timely delivery of response and services. NCCP is the ecumenical fellowship of Protestant and non-Roman Catholic denominations in the Philippines, working on humanitarian, development and advocacy as part of its programs. PHILRADS is the relief and development arm of PCEC, working hand-in-hand with the local churches doing its holistic ministries. NASSA/Caritas Philippines is the humanitarian, development and advocacy arm of the Catholic Bishops’ Conference of the Philippines.